UBICACION EXCELENTE PARA VER EL ESPECTACULO QUE DURA TODA LA NOCHE. SHOWS EXCELENTES. AMBIENTACION DE PRIMERA. MUY RECOMENDABLE. We bought the VIP which I felt wasn't maybe quite worth it but we still had a blast. Only thing we would change is how much we paid! First off, my husband and I was told that we didn't have reservations when we even showed the rep of Coco Bongo on my phone the reservation number. Finally, after more than 30 minutes the rep said, It was ok he was going to let us get in. 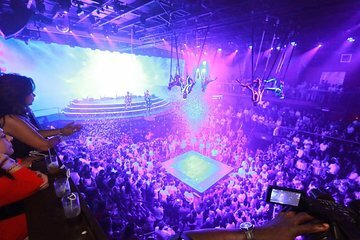 After entering into Coco Bongo and we realized that we were not going to have seats to sit our perception of this place from the online advertisement was ALL WRONG! We thought that we had a chance to sit and see at least 10 shows etc. But what we dealt with was reps of Coco Bongo shoving bottles of hard liquor in people faces on stage and assisting upon them to take shots. Once an individual accepted the shot the rep would shake the individuals head and shake them as well! This type of behavior wasn't what my husband and I expected. I am not a negative person overall, so I'll admit that my husband and I stayed in Coco Bongo for 2 hours and left and stayed out in front until our bus returned but there were 2 parts of the show that we enjoyed. Anyone reading this please note if you do not like loud and rowdy crowds and hard liquor being shoved in your face so you can take a shot then this is not the place for you!